To upload reports, you need an account and a guild. 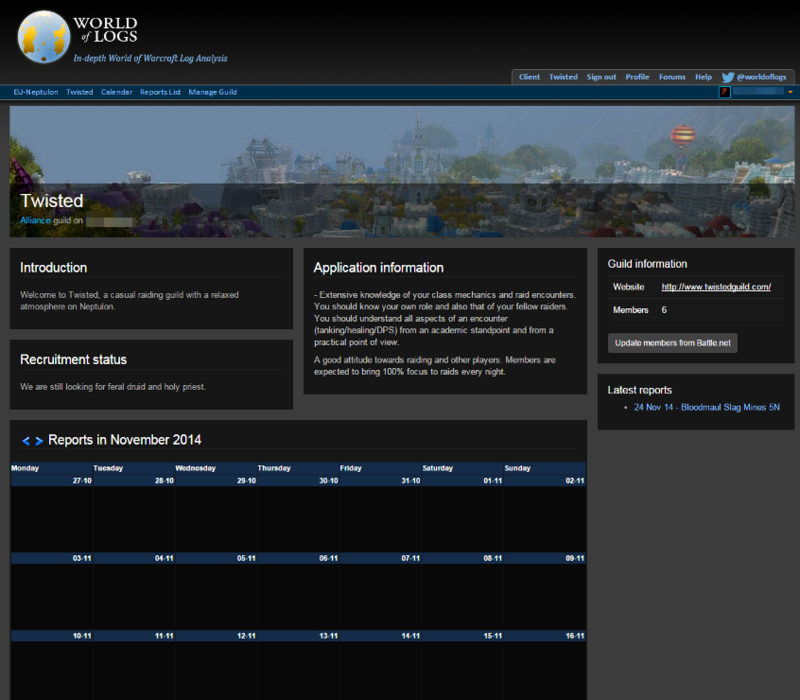 Here's a help page explaining how to register an account on WoL. If you're using WoL for the first time, you might find it useful to go through some the introduction guides for WoL that we've collected from different websites, including video tutorials. We would like to thank all the authors for putting so much efforts in writing and recording all those amazing guides. If you need any help using the site, you can contact us via several ways. For community help, there's the help forum. If you want to contact us directly instead, you can send an email to support@worldoflogs.com. 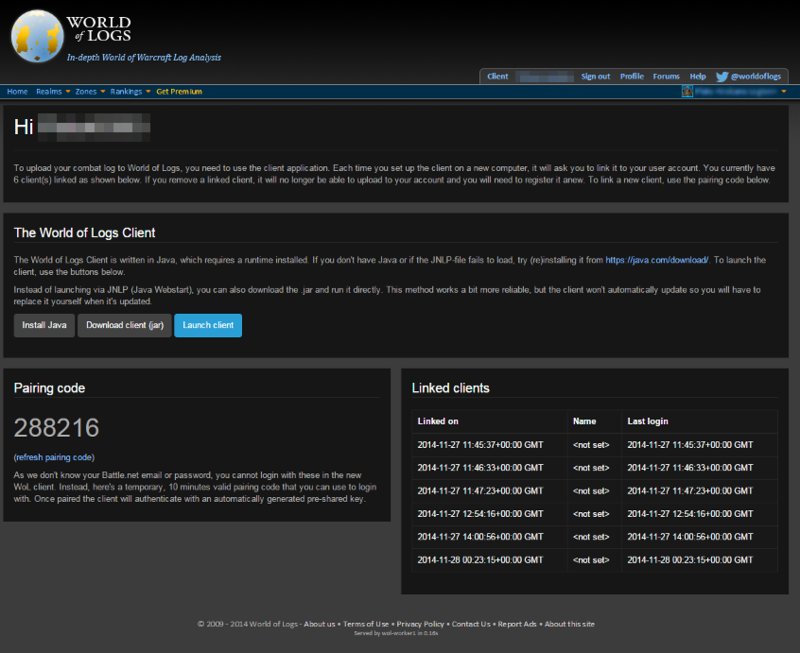 If you're combat log has become too big to upload to WoL, our WoL client has a function to zip and split your combat log. Q: Why are some spells split into a few lines in spell details? When you ("You" or "User") use Worldoflogs.com (Worldoflogs.com and related domains) and its related services ("Site") You agree to the following terms and conditions (the "Agreement"). Worldoflogs.com ("Worldoflogs.com " "us" or "we") may at our sole discretion revise these terms from time to time, or at any time, by updating this posting. Unless otherwise provided below, the revised terms will take effect when they are posted. BY CONTINUING TO USE THE SITE, YOU ARE INDICATING YOUR ACCEPTANCE OF AND AGREEMENT TO BE BOUND BY THE TERMS OF THIS AGREEMENT AND ALL REVISIONS THEREOF. To upload reports, you need to have an active account and guild. This page will guide you through the registration process. With Battle.net integration, the old system of applying to guilds and managing members on World of Logs is now obsolete. 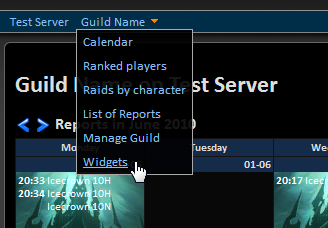 To gain access to your guild's private information or to manage it, just login with Battle.net and refresh your character list in the profile page. 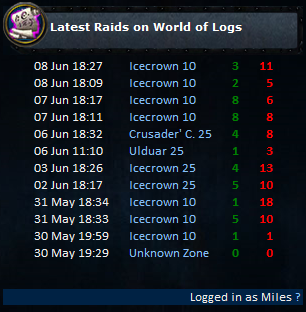 From now on, login on World of Logs will be with an Battle.net account. 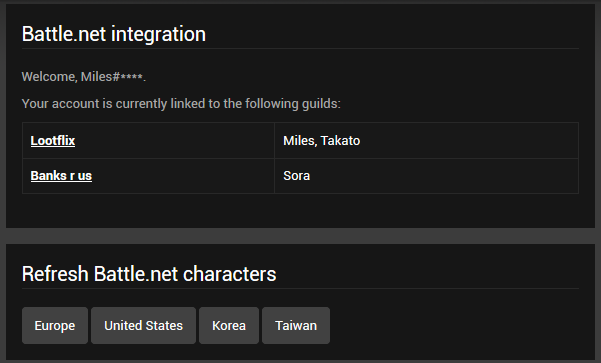 With this new feature, we can automatically retrieve your characters and guilds from Battle.net so you don't have to create them anymore. This also solves all permission issues - if you're the guild leader or rank 1 in the game, you'll be able to manage the guild's settings. With this change, you'll also be able to upload to multiple guilds within the client, just select the character to upload to before you press upload. You also have the choice to upload the report to your own private personal space, but be aware that this isn't shared and ranked, and only you or someone with a direct link will be able to view the report.